Happy weekending! 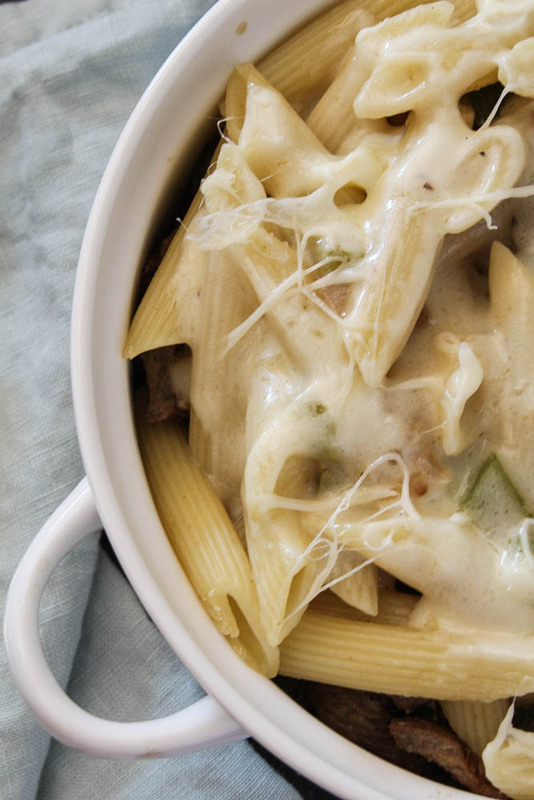 I made this casserole last week and have been craving it again ever since! 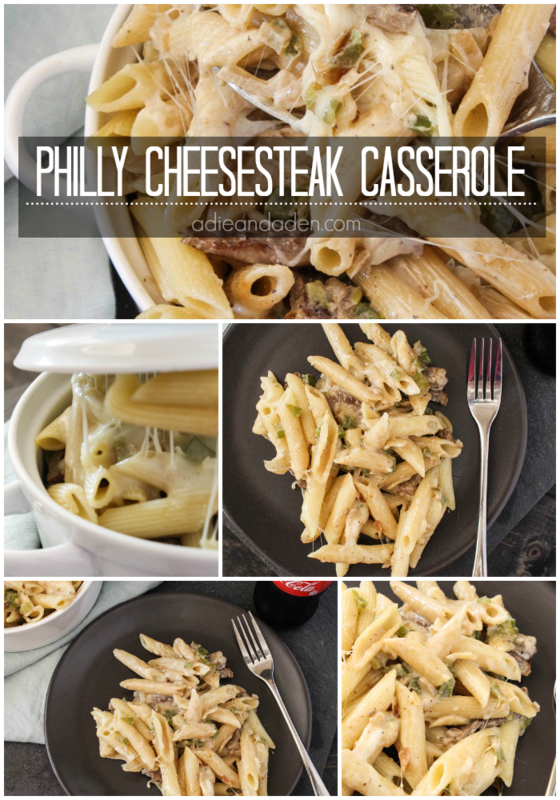 This casserole combines everything you love about a Philly Cheesesteak into one easy to make dinner! 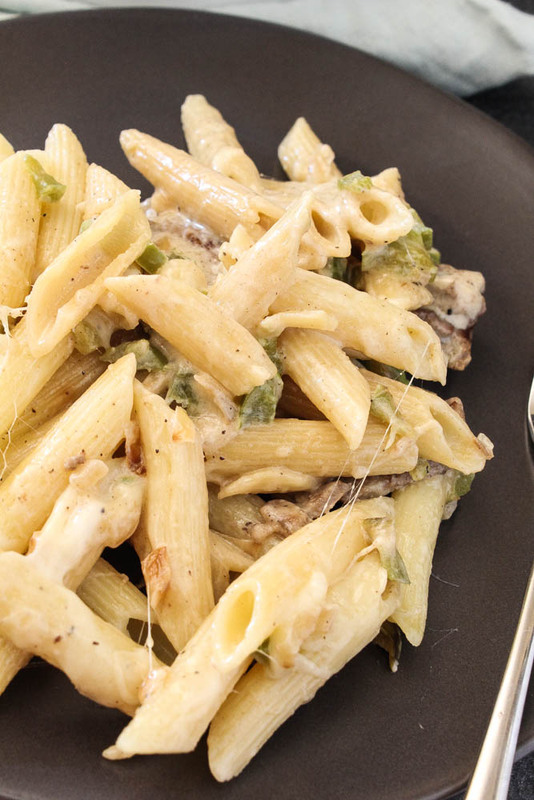 The chopped up green peppers, the melty ooey gooey provolone cheese mixed with penne pasta! Hashtag can't get enough! My husband has been making Philly Cheesesteak sandwiches and that gets boring super quick and not to mention our little toddler babes wont eat it ... the typical! But this casserole was a huge hit with everyone! 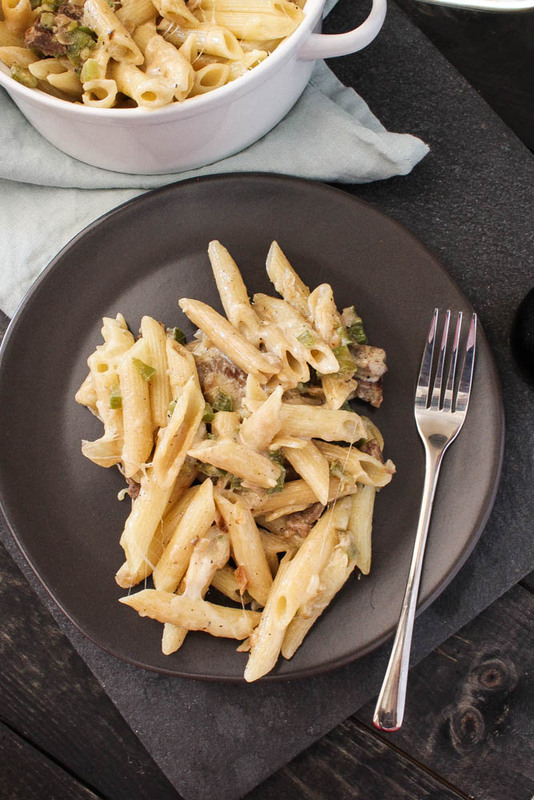 Simple, quick and leaving you with no leftovers! 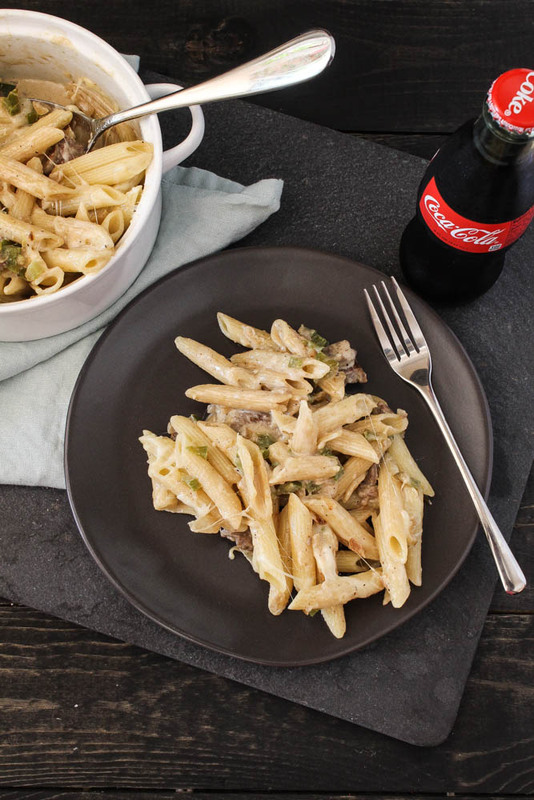 Cook pasta according to the package and drain with warm water and set aside. Get your olive oil nice and warm in a skillet, add your chopped onion and peppers. Sautè on medium high heat for about 5 minutes. Add the mushrooms (I left out mushrooms because I hate them!) and sautè for another 5 minutes. Set aside.There's enough fat in the rib-eye (same with the ground beef, but if you are using flank steak, add a little oil) you can just put the beef in the skillet as is. Cook, stirring frequently for just a minute or so. The meat is thinly sliced enough that it only takes about a minute to cook through. It's okay if the meat breaks apart. Immediately add the pepper mixture back to the skillet with the beef. Add your seasonings, cream, and milk. Bring to a light boil, stirring constantly - shouldn't take long for the mixture to thicken. 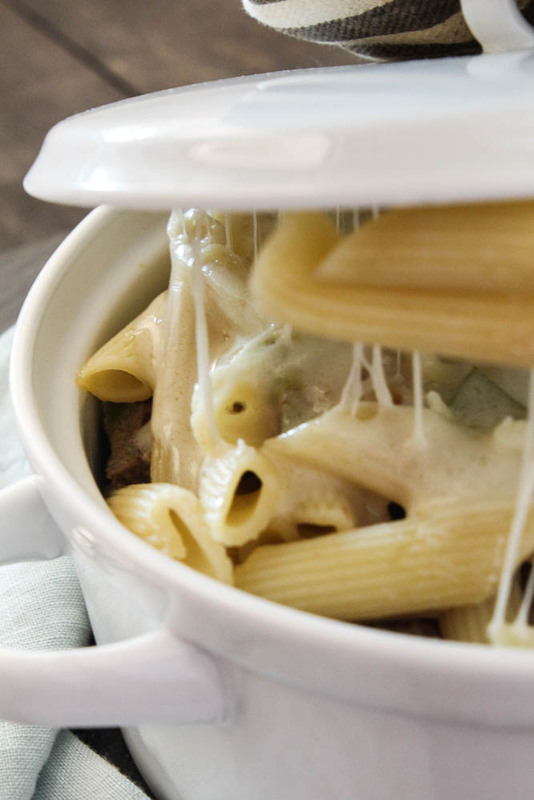 Remove from heat.In a casserole dish add 1/2 of your cooked penne pasta, your meat mixture and provolone cheese. 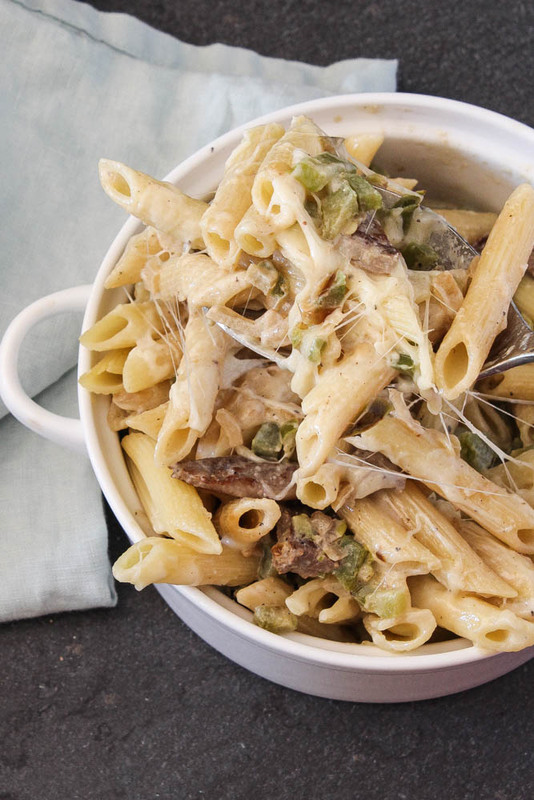 Layer with the rest of your penne pasta and another layer of cheese!Bake for about 10-15 minutes until the cheese is melted! *helpful: you may want to cut your steak into little pieces before cooking them in the skillet ... it worked best for me that way. Also, if you cannot find grated provolone cheese use slices! Enjoy and cheers to Sunday dinner!